Oooh, Shinies! : Hmm...do I like it or not? Today I wanted to try something new, a new color, a new plate, and a lot more rhinestones than I usually do. Grey is another color that I like in the bottle, on wheels and on others, but I'm not so sure about it for myself. Unfortunately it also has a little bit lobster effect on me. 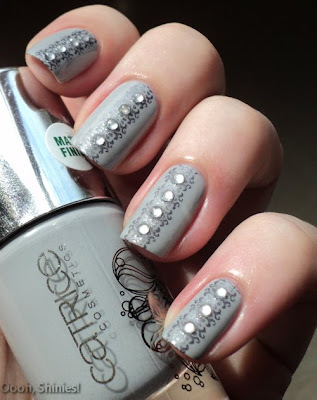 I started with 2 coats of Catrice Pebble Beach, which I have for quite some time now. I tried it on some nails, but never really wore it. 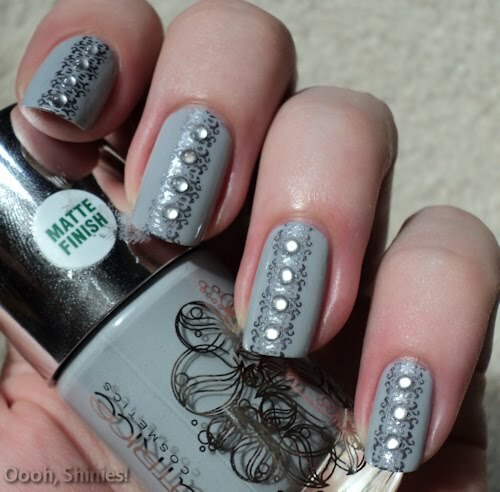 I stamped it with China Glaze Awaken and BM plate 11, and then I added some rhinestones. I'm still not sure what to think of the result, from a distance it looks nice, but I think it's a bit too much for me. The stones aren't perfectly straight, but you don't see that so well irl. And yes, that's a fingerprint in polish on the cap :P I'm not sure when that happened, I noticed it on the pictures lol.